Monday mornings call for coffee and quick and easy breakfasts, if you’re like me and wanting those few extra minutes of sleep. Today is the perfect day to finally share my Tropcial Turmeric Overnight Oats! These oats are a favorite and I photographed them to share with you at the end of last year but haven’t shared the recipe even thought they’re in my regular breakfast rotation. I’ve shared them on Instagram Stories but that’s about it. Dreaming of sunshine filled days as we’re headed to California next week and we just got over a foot of snow here the end of last week and over the weekend I’ve been warming up these tropical oats, adding the pineapple and berries after on top. I’m packing in all the turmeric still this week after taking a spill sledding last week sliding into a tree. Pushing it like I often do I went to my Empower Class at barre two days after and popped my hip and made things worse. One of these days I’ll learn and as hard as it is I’ll be taking it extra easy this week. So careful I’ll be stretching and not working out today, well unless I wake up and something has drastically changed overnight. Fingers crossed I’ll be able to head back to my classic barre class tomorrow. 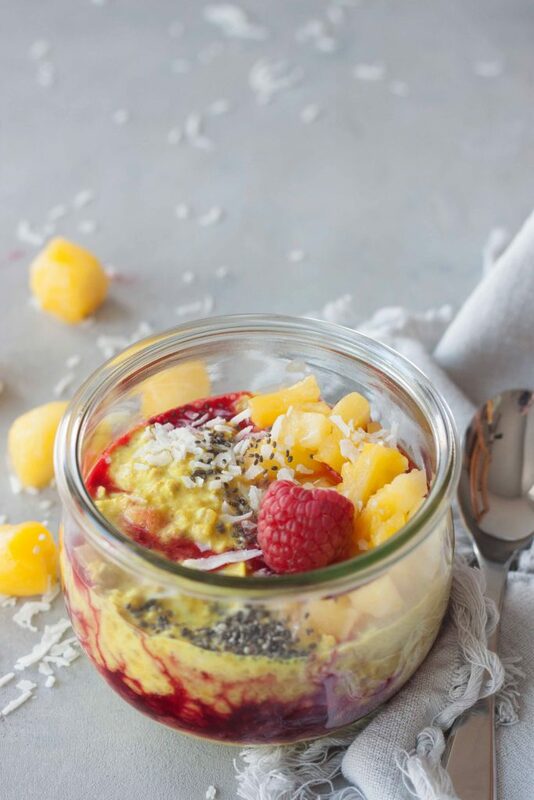 Now to the Tropical Turmeric Overnight Oats that will brighten any morning! You don’t have to be in pain or trying to reduce inflammation to enjoy this combo. Aside from just being delicious it can help with the oxidative stress you can’t see. All you need are oats, chia seeds (hello healthy omegas), and turmeric milk for the base. You can make your own Golden Turmeric Milk or use a store bought one like REBBL. Either way they’re quick and easy and if making it yourself it only requires a few ingredients that you probably already have in your kitchen. 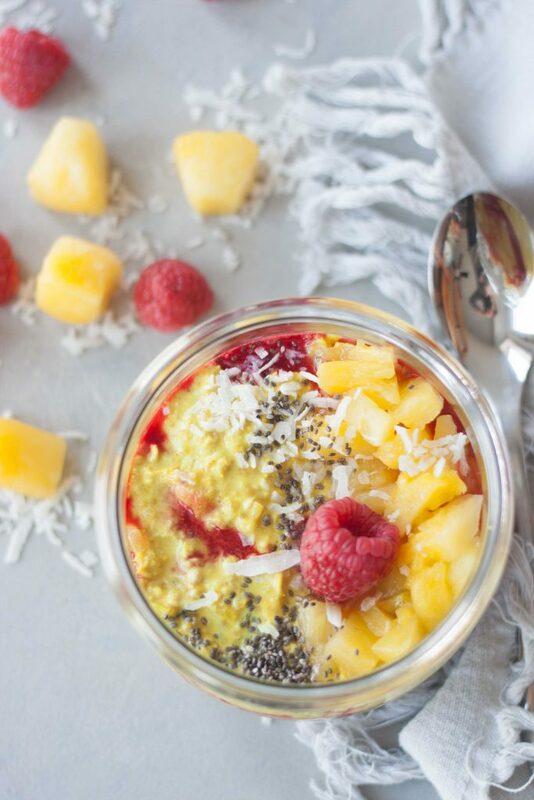 Mix them together, stir in pineapple (frozen works great no need for a fresh pineapple if you have it in your freezer) and a little coconut, layer with fresh berries (I love bright antioxidant rich raspberries and their tart but sweet flavor) and then toppings. One bite will make you say Mmm… and have you dreaming about sitting in the sun even if it’s freezing cold and snowing outside! This is one of those recipes again where I tell you to adapt to what you like. If you don’t like coconut, omit it. If you have strawberries or blueberries and not raspberries, use those. It’s also a recipe that has me laughing (sorry I know I really shouldn’t laugh at others) at those who think eating healthy is boring or hard. Trust me there is nothing boring or hard about these Tropical Turmeric Overnight Oats. 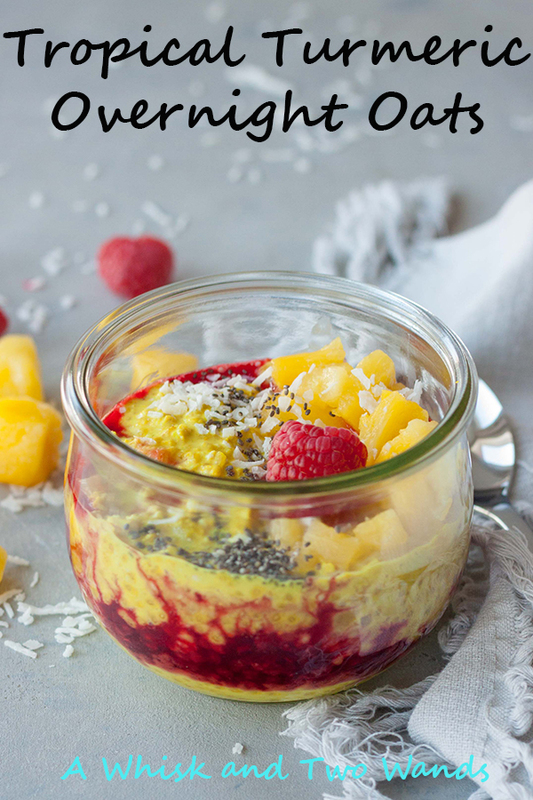 If you still haven’t tired overnight oats, turmeric milk, or chia seeds try them all in this recipe and I think you’ll be pleasantly surprised! Hot or cold these oats hit the spot. Really what do you have to lose? 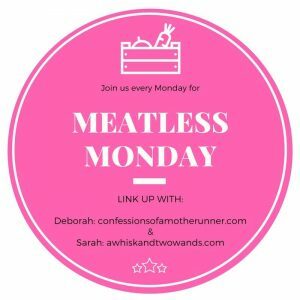 Today is not just Monday but of course Meatless Monday, my co-host Deborah and I look forward to seeing what’s cooking (or not if you’re like me this week) in your kitchen. Link up below or tell us in the comments! 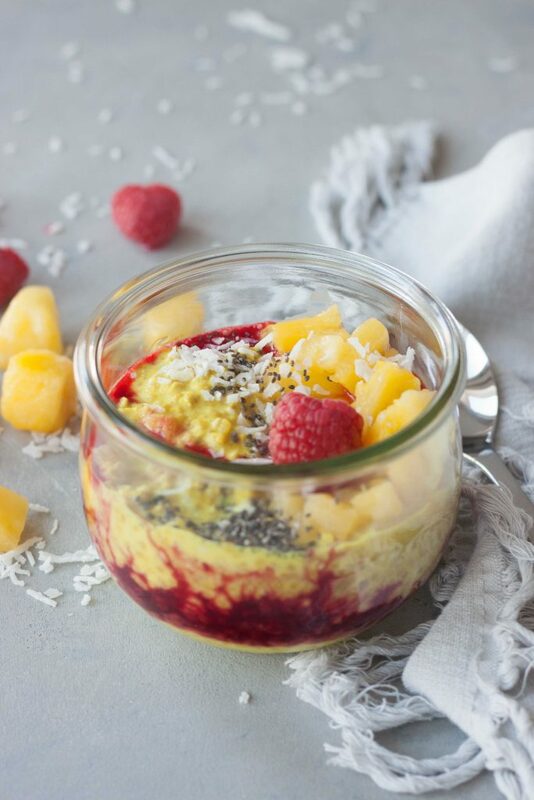 Quick, easy, delicious, and nutritious Tropical Turmeric Overnight Oats are a great way to start and brighten any morning! Plant-based, vegan, and gluten free friendly. In a glass jar mix together oats, 1 tablespoon chia seeds, and golden turmeric milk. Chop pineapple, it can still be frozen, and stir into the oat mixture saving a little for the top if desired. As well as half of the shredded coconut. If you want to layer it with the berries in the middle you will want to wait 5 minutes or assemble in the morning. Otherwise for quick and easy add berries to the top or bottom of the oat mixture. Layer now with frozen berries, if wanting to assemble it in the morning you will want your berries defrosted. Top with remaining coconut, chia seeds, and optional fresh raspberries. Customize these versatile overnight oats adding in your favorite vanilla protein (I like Vega Sport in this one post workout), superfoods and adaptogens (maca is one I like to add), and or collagen. You may need to add a little extra golden milk depending on what you add to reach desired consistency. I’m dreaming of sitting in the sun already! This sounds fantastic! Counting down the minutes and hoping our flight isn’t canceled (school is cancelled tomorrow, big snowstorm coming) to head to the sunshine! I still need to try turmeric milk! This looks like such a great combo! I hope you give it a try, it’s so good and good for you! I know you love the golden turmeric milk-I think I am going to have to try it! This bowl looks spring like and delicious. happy Monday! I am on a big tropical flavor streak right now – loving pineapple and mango everything so these oats are perfect!